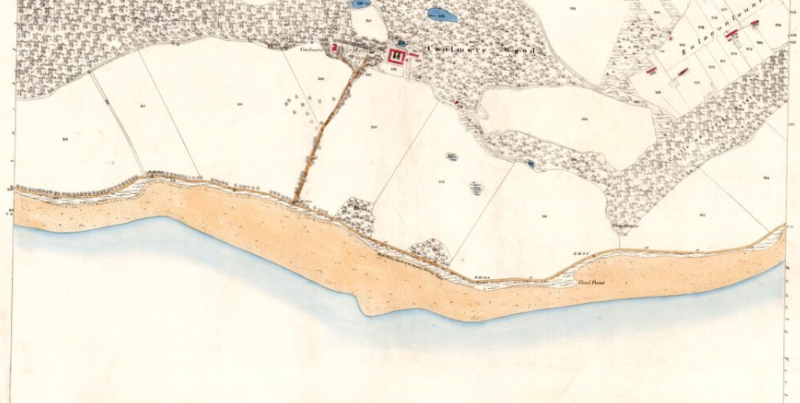 The copses can be seen on the earlier Ordnance Survey maps of the area. Note the pier at Coul Point. It was likely that the timber felled here was carted to North Kessock harbour and shipped off here to larger boats for export, rather than this slighter jetty. The copse to the west has been largely removed as can be seen from the aerial photograph, though remnant coppiced trees still survive along the field boundaries. 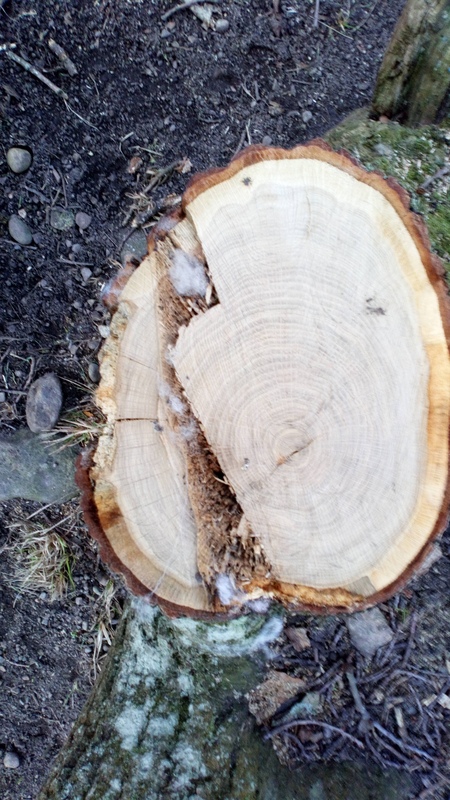 There has been recent felling of some of the stems in this wood and the largest of these has, at a rough count, approximately 100 rings which would accord well with the wood last being cleared for timber during the 1st World War. According to the excellent Redcastle: a place in Scotland’s history (Graham Clark 2009, London) the woods on the Redcastle Estate were first extensively planted under the ownership of James Grant of Shewglie in 1790 and he is recorded as paying £39-10s to George Brown of Inverness for 300,000 Scots firs (1/6d per dozen) and 30,000 2 year old larch trees 98d per 1,000). The estate was sold in 1829 to Sir William Fettes (an Edinburgh shipping merchant, twice provost there and whose bequest founded Fettes College) and he seems to have purchased partly on account of the woodlands, as his accounts tell of timber being shipped out to Newcastle for use of pit props. 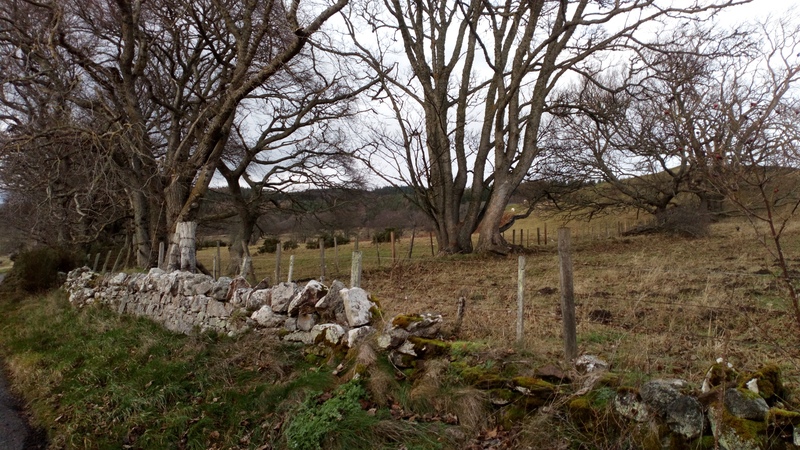 The subsequent owners, the Baillie family of Tarradale and then Dochfour continued to invest in woodlands and other agricultural changes to the estate. The marriage of Nellie Burton to James Baillie in 31st January 1894 (the marriage celebrations included the felling of 400 trees and the building of a pyre 70 foot high on Gallows Hill! ), brought additional investment into estate improvements, especially Redcastle itself. 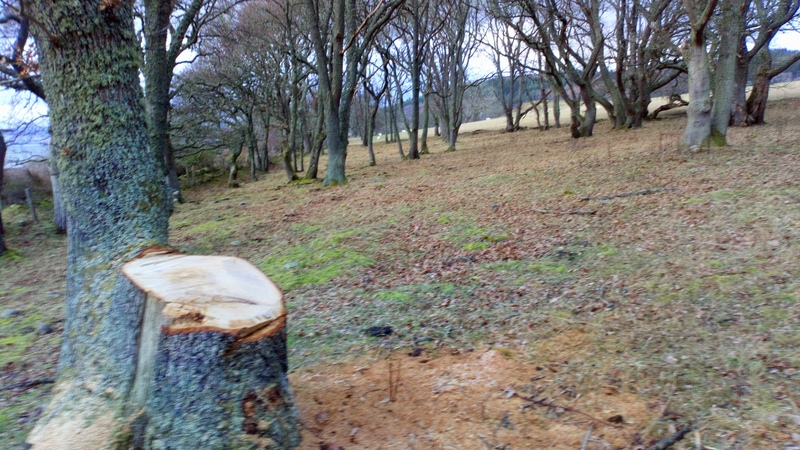 It is not clear how much regular felling was taking place during these years but it is clear the 1st World War would be an important stimulus to felling timber. Also these trees are unlikely to have been coppiced standards unless there had already been a cycle of coppicing on these trees previously. Some of the cut stems seem to date to a more recent felling but are probably just the result of later secondary growth. 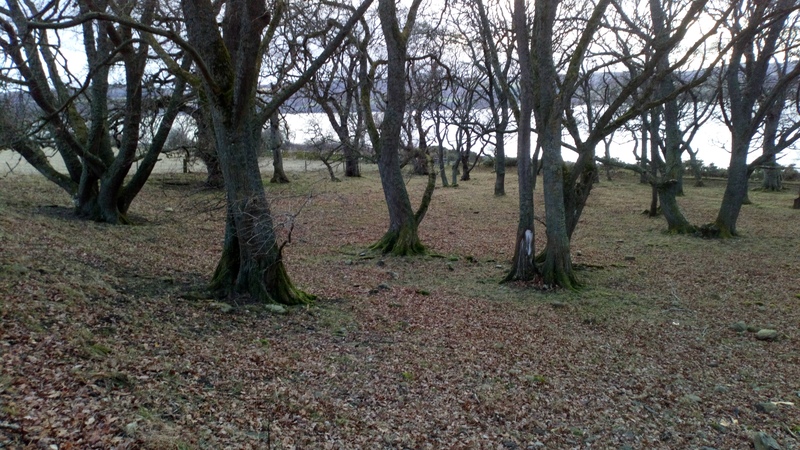 Further signs of coppiced woodland possibly survive to the west , beyond Corgrain Point though this area is now overgrown with secondary birch and elsewhere the mature oak woodlands on the raised beach and above the Caravan Park appear now as mature standards with no evidence of coppicing. Further more detailed searching may reveal more evidence of coppiced woodlands on the Redcastle Estate but this seems unlikely with the extensive conifer plantations now dominating these woodlands. As the Coulmore Copse itself is trimmed and felled, the surviving coppice wood will itself disappear. This is Coulmore Farm land owned by the Scobies and not Redcastle Estate which is nearby. From memory according to the HER there is Bronze Age settlement amongst these trees or nearby which were connected to the fish traps along the shore. You are, of course, correct so I have altered the title of this article. Planting and initial coppicing will have been done while it was still under the ownership of Redcastle. There is nothing in the HER to suggest Bronze Age settlement in the vicinity, though there is a reference (MHG8250) to an enclosure from cropmark evidence on the slope above and this has been interpreted as a Castle site, though not on very strong grounds. I would suggest that the fishtrap, as surviving, is only likely to be 18th/19th century in date – not that earlier fishtraps may be buried under the mud. Hi Jonathan. I was up at Redcastle yesterday and hidden from the road is also an extensive area of Sweet Chestnut coppice. It looks like it was active not that long ago as there are still piles of decaying brash visible. This is on Redcastle land behind the retaining wall that starts to the west of Ronald and Neil Scobies property. It is about a third of the way between there and the castle ruins. I did think I could see from the road that there were some multi-stemmed trees in the woods behind this wall, though now rather obscured by secondary growth, primarily of birch – but I haven’t walked it myself. 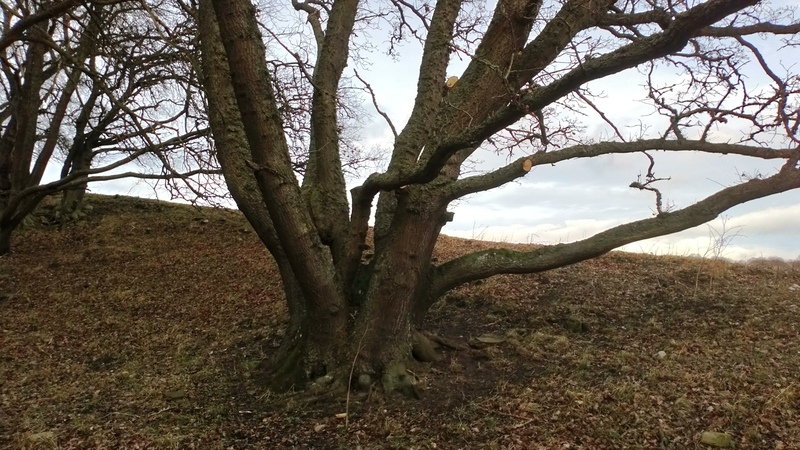 There are some multi-stemmed trees on the top of the bank and ditch by the adjoining field to the East which you can see from the road but this could just be clearance rather than deliberate coppicing. Chestnut is, of course, still coppiced in England and so there might still be a market for this. The Coulmore plantation has not been systematically coppiced for many years which makes it an interesting survival, almost an artefact in itself.